There are six major media options with which to run advertisements: television, radio, newspapers, magazines, Internet and outdoor. The first five should be quite familiar to consumers, because they often come into contact with these media for purposes of entertainment and information. The sixth is different in that nobody goes out looking for an outdoor ad in the way they would look for a television program, radio show, newspaper, magazine or website. Outdoor advertisements are usually out there waiting for the consumer to come along. The term 'outdoor media' is very broad and it actually includes a lot of different options. In the chart below, I have shown the survey results from the TGI Argentina study conducted by IBOPE. This is a survey of 10,244 persons between the ages of 12 to 75 interviewed across in person at their homes across Argentina during year 2004. 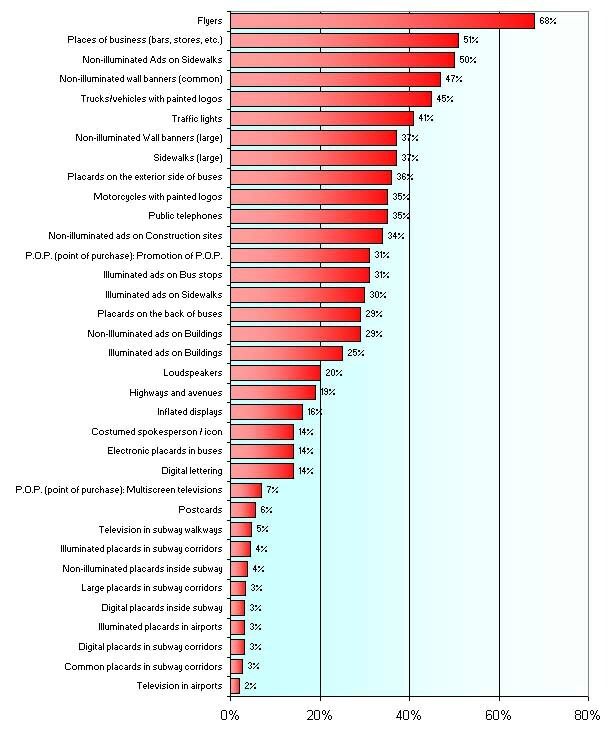 During this survey, we asked people about their exposures to various types of outdoor media options that they had been exposed to during the past 7 days. The numbers in the chart are the incidences. How might we come up with an taxonomic scheme for these outdoor media options? For TGI Argentina, we generally classify according to these properties of the outdoor media: illuminated; non-illuminated; subway; traffic; point of purchase; and other means. While this is convenient and comprehensible, it does not necessarily have any implications for the relationship to the advertising campaign. Which ones shall you choose? This would offer some guidelines about the choice of outdoor media with respect to the objective of the advertising campaign (brand awareness? brand recall? brand attitudes? short-term and long-term brand purchases?). But my complacency has just been shattered by an article in East Week with the photo below. 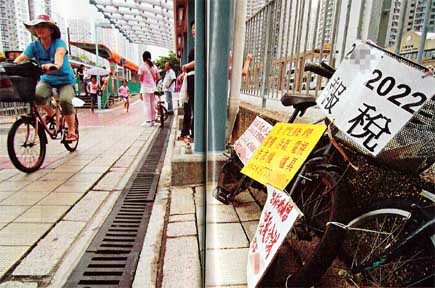 The place is Tin Shui Wai, a Hong Kong satellite town with more than its share of problems in unemployment, domestic violence, single parenthood, wayward youths, ... For the past year, it has been noticed that the sidewalks are parked with bicycles with all manners of advertising placards on them. These advertisements offer services in termite extermination, income tax filing, house painting, fixing consumer electronic items, tutoring, etc. They have been put up by people desperate to make some extra money in order to make ends meet. How did this come about? It is the rule of law, followed to the point of obstinacy. And the law is always reactive and lagging behind social developments. In Hong Kong, if you post an advertisement on the wall of a building, it will be removed promptly and you may even be prosecuted for defacing private or public property. But a bicycle -- even if it is old, decrepit and rusted -- is private property and therefore its owner is entitled to hang a placard on it. If trucks can have painted signs on them, so can bicycles. Thus, these intrepid entrepreneurs go around looking for unused bikes to hang their placards. To the extent that the bikes have been abandoned, nobody knows who the real owners are.